Why Am I Dancing in Front of 1,000 People? There are so many wonderful causes to support with our talent, time, and treasures! Every one of us gets solicited to support some amazing and worthy cause- Myself included. I often get solicited to be the “token Hispanic” or “woman of color” so I’ve learned to be judicious on which activities and initiatives I champion; considering the impact, expectations around tasks and fundraising and I’ve learned to align these choices to satisfy various facets of my being. Yes, I need to “network” to grow the business. Yes, I have a duty to “give back” to our communities. Yes, I have to “serve” as a role model for my kids. Yes, I have to “feed” my soul and be inspired, that my contribution does in fact matter and does impact change and improvement. But who has time to support 7 or 8 different organizations simultaneously? Allow me to clarify: I don’t mean, participating on a quick initiative or chiming in to plan an event. But rather, actively and meaningfully participating on a board or committee, not just being the “token” gal. In essence, I prioritize causes that satisfy multiple buckets: those that inspire me, those that drive sustainable change while serving and/or empowering the community. Hence you will find me decked out in a flashy costume, competing as a Dancing Star during the Alzheimer’s Association Memory Ball on April 28th. Yes, I agreed to train for 3 months, learn an intricate choreographed dance routine that will be performed LIVE IN FRONT OF 1,000 of Baltimore’s who’s who… And did I mention that the event will also be streamed live online? Why Alzheimer’s? When there’s Immigration, Breast Cancer, Social Justice or Women’s Equity? Simple, to honor my Father, Juan Namnun. Let me tell you about this courageous firefighter who stood toe to toe against a dictator, risking his life and that of his entire family. Upon being introduced to the Dominican dictator, Rafael Leonidas Trujillo, Papi requested a fire engine for Azua, a more centrally located town south of his home town, San Juan de la Maguana. Trujillo, acting generously and on a whim, agreed to provide the engine, but for San Juan. As Trujillo turned away, my father called out “No, your Excellency.” The silence was deafening. Trujillo strolled back to my father. He assessed this person who dared to disagree with him, especially publicly. The soldiers had their hands on their weapons… At the ready. My father knew he had crossed the line from bravery into lunacy. My father lived on to established the Fire Department of San Juan, hired and trained a body of volunteer fire fighters that served the region; a Department that stands today due to his commitment and dedication. In 2016, the Council of San Juan renamed and dedicated the Fire Department in my Father’s honor. Today, my Father sits in a chair in Philadelphia, lost in his own mind. The courageous man who wore some many influential hats, from fire chief, tango singer, Commerce Secretary, baseball umpire does not recall his legacy. So, I dance… For him. For the many families that still don’t know that this behavior is not just “old age” but a Syndrome with symptoms that affect mental cognitive tasks such as memory and reasoning. Latinos are 1.5x more likely to suffer from Alzheimer’s and 34% more likely to be undiagnosed. So, I dance… For them. For the Latina mom who ties her aging father to his bed, because he loves to go for walks and gets lost, while she heads out to work. She doesn’t know there are available resources including care, support groups and facilities, often in Spanish to help her and her Papi. I’m dancing to raise awareness and funds, in hopes of educating as many Latinos as possible that this is a serious issue with our aging population and it is so much more than “they’re getting old” – To raise funds to increase medical research and identify why certain populations are predisposed to suffer at higher rates… This is why I dance. 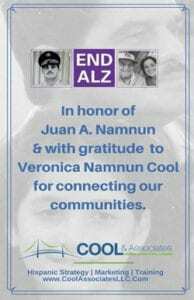 Amigos- learn more, and consider making a donation, by visiting alz and be sure to tune in April 28th, 2018 to be entertained!